Currently Atlantic Canada’s only Grade 1 contingent, the 78th Highlanders (Halifax Citadel) Pipe Band has achieved a number of pipe band firsts: the first from the region to win the Grade 1 Canadian Pipe Band Championship, the first to win the Grade 1 North American Pipe Band Championship, and the first to make it through to the final round at the Grade 1 World Pipe Band Championship. While these accomplishments have no doubt been the result of an extremely well directed group effort, the dynamic and talented leader of the group has been Pipe Major Roderick MacLean. Roderick was born to Alistair and Helen MacLean in Edinburgh, Scotland in 1970. His family moved to Kingston, Ontario when he was about 18 months old and he lived there until the age of 25. In addition to music, he was interested in sports in general but basketball in particular, and took a great liking to history, especially military, British and Irish history. After high school, he attended Queen’s University to further developed this interest, gaining a Bachelor of Arts Degree (History) in 1993, and a Master of Arts Degree (History) in 1995 before moving on to the University of Toronto where he gained a Master of Museum Studies Degree in 1997. "My grandfather was an extremely good pianist/organist so I suppose that’s where the musical bent comes from," says Roderick. "When we were kids, my mother said that my two sisters and I had to at least try taking music lessons for a time. The choice of instruments was ours. I picked the bagpipe." Roderick learned to play the pipes in Kingston. "I had a number of (piping) teachers when I was just starting out," he explains." Probably the most influential at that point was Hugh Goldie who was the Pipe-Major of the Rob Roy Pipe Band. Hugh and his wife Liz had immigrated to Canada from Scotland, in the 1960s I believe. Before he came over, he had been playing with the Boghall and Bathgate Pipe Band under P/M Robert Martin. 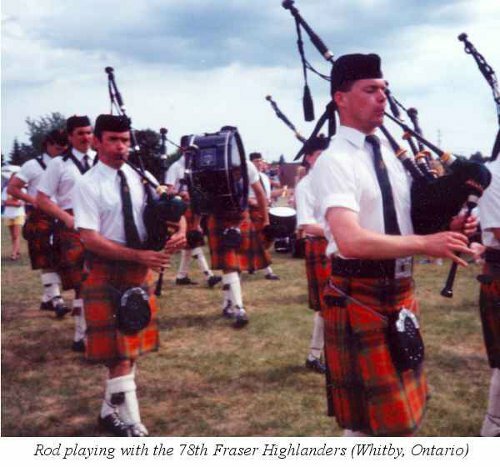 He took over the Rob Roy around about 1981-82 or so and, in 1984, the band won Maxville and the Pipers and Pipe Band Society of Ontario’s Champion Supreme award in Grade 4 under his leadership. Hugh was an excellent teacher of the fundamentals of piping: accurate technique, producing a good sound, the importance of attacks and cut-offs in a band situation. He and Liz were also good enough to haul me around to various different competitions, as well as the others from the band that were my age, which helped to foster a great camaraderie in the group at the same time. "There have been so many people who have been good enough to give me the benefit of their knowledge," Roderick continues. "Scott Bell and Peter Barbier were two pipers in the Rob Roy who taught me for a time. 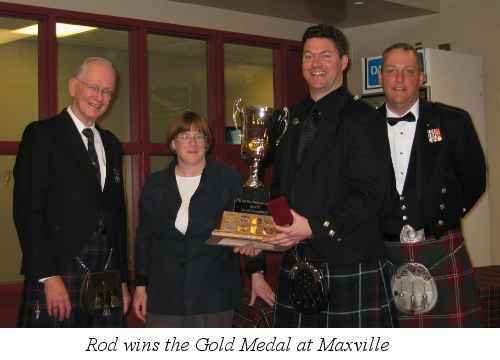 Scott is the current Pipe-Major, and led the band to the Champion Supreme award in Ontario in 2005. 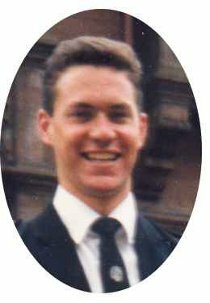 Certainly I was greatly influenced by the existence of the Seaway International School of Piping – a summer school run by the late Captain John MacLellan and his son Colin. That was where I got my first introduction to piobaireachd from Bill Livingstone and Ed Neigh. I was also fortunate to have Michael Grey’s help for a number of years in my late-teens and early-20s and additional instruction from Bill in my mid-20s when I was competing in the senior amateur grade. It was their help that allowed me to progress to the Professional category. "My current teacher is Bruce Gandy (see Celtic Heritage, Nov/Dec ’01). Any recent competitive successes I’ve had have been largely due to Bruce’s instruction. He has been great with showing me how to put the finishing touches on tunes – although I don’t know whether I’ve been actually able to get those nuances to come out or not all the time!" "Roddy is an extremely hard working piper," says Bruce. "In fact, as I write this, he is working on Lament for the Only Son in the other room, getting ready for next year. His preparation for the big medals at Oban and Inverness is methodical and logical. He knows how much to play to get the desired amount of successful practice in, and he also knows when enough is enough or when it's time to rethink the music. He takes not only my opinions and teachings for the tunes, but he also will research others, copying out the differences on the paper and then discussing them with me to come up with the best musical score for a tune." 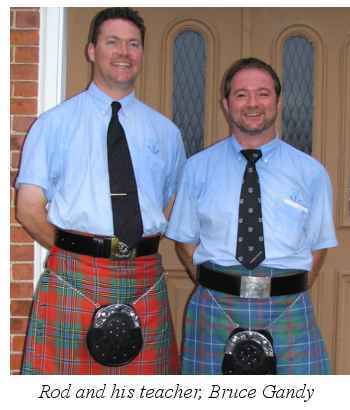 Roderick’s first pipe band was the Rob Roy Pipe Band in Kingston, Ontario under Pipe-Majors Hugh Goldie and Scott Bell. "The band runs a teaching organization for piping, drumming and dancing and that’s where I started learning at the age of seven or eight. I played with the group from about 1982 till1991 when I was invited to play with the Grade 1 78th Fraser Highlanders Pipe Band under Pipe-Major Bill Livingstone. I stayed with the 78th Frasers until moving to Nova Scotia in 1997. My current band, of course, is the 78th Highlanders (Halifax Citadel) Pipe Band. I joined them when the group was under the direction of Pipe Major John Walsh and sponsored by the Halifax Police. I have been the band’s pipe major since 2000." Playing with these bands has influenced Roderick’s development as a piper and as a pipe major. "The Rob Roy band taught me how to play, how to function as part of a team, and the fundamentals of good pipe band performances. The 78th Frasers taught me about excellence – what it takes to achieve it, the amount of practice, the intensity of practice, the level of commitment; the thrill of being part of something special at the highest level, and the production of music - both composition and arrangement. "I remember being quite petrified the first practice I attended with the 78th Frasers," Roderick recalls. "I found myself sitting at the practice chanter table with people whom I considered to be piping "gods" at the time. There were two Clasp winners, Bill and Jim McGillivray, and then the guys who were currently winning the professional solos in Ontario - Bruce Gandy, Michael Grey, Andrew Bonar, and Andrew Berthoff. All the other players had about 10-15 years of grade one band experience and there were only two new people, Jenny Hazzard and myself. It was quite humbling. "The 78th Highlanders (Halifax Citadel) has been one of the most rewarding aspects of my involvement with piping. It’s extremely satisfying to see the band grow as a team and have success. As with any group that’s attempting to improve, there can be trying times, of course. We went to the World’s in 2000 with only ten pipers on the field and I remember that year being quite stressful. At the same time, I was convinced that, if we worked consistently, we would improve, attract more players and, with some luck, win some prizes. It’s worked out better than I could have hoped, actually. Within recent years, the 78th Highlanders’ (Halifax Citadel) has proven to be successful on the competition field. "Winning both (the Canadian Championship) at Fort Erie and (the North American Championship) at Maxville in 2003 was really quite a surprise for us," says Roderick, "and that’s what helped make it such a great experience. I felt especially happy for the people who had been with the group from its days in Grade Three and who had persevered all the way through to that point. The feeling in the group was just fantastic." "As a bandleader, Roddie is very efficient," says fellow bandsman, Bruce Gandy. "He knows when and where to delegate responsibilities for music or set up but at the same time still keeps the group together as a team captain and has led the band well reaching new peaks each year." In addition to his work with the 78th Highlanders (Halifax Citadel) Pipe Band, Roderick has had a very successful solo career. The recent highlights are: ACPBA Gold Medal Piobaireachd Challenge winner, 2003 and 2004 in Antigonish; the Piobaireachd Society Gold Medal (Canada) winner, 2004 in Maxville; second place in the Cameron-Gillis Piobaireachd competition (Dan Reid Invitational) in San Francisco; and being accepted to compete at the Silver Medal contest at both Oban and the Northern Meeting, 2005. "My most significant solo competitive achievement to date was winning the Gold Medal for Piobaireachd at Maxville in 2004, but I think the most memorable events so far have to have been this past summer, competing for the Silver Medals at the Argyllshire Gathering, held at Oban and at the Northern Meeting, held this year in Aviemore. I had never competed in the solos in Scotland before, and it was certainly interesting. On top of trying to figure out how everything works, you’re also trying to play at a really high level and those that you’re competing against are all really good. In addition, there are three adjudicators listening, so you’ve got to have everything going right to get a prize - pipe, technique, and presentation. It was another humbling experience in some ways but its also really motivated me." 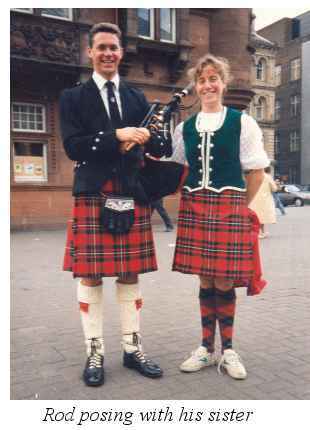 Roderick has always loved travelling, and his piping has taken him to a great many places. "I’ve been all over, actually. There was Scotland, of course. This year I flew over three times to play at the World Pipe Band Championships and the Oban and Northern Meeting solo competitions. As a result of the win at the Gold Medal at Maxville last year, I was invited to play at the G.S. MacLennan contest in San Diego and at the Cameron-Gillis competition at the Dan Reid Memorial in San Francisco. I was also in Florida last March, playing as part of the 78th Highlanders’ historical band in Miami, and in Delaware for the United States Piping Foundation’s contest in April. All that has been in the past twelve months!" Although he has not spent a great deal of time on it, Roderick has been dabbling in composing. "Bruce Gandy published a few things of mine in his last book and I think there’s a few more that he’s including in the new one. They’re mostly pretty simple tunes and a couple of arrangements as well." Since moving to Halifax in 1997, Roderick has been teaching pretty well constantly. "Although my primary occupation is as Curator of the Army Museum, a military history museum located at the Halifax Citadel National Historic Site of Canada, I am also employed by the Halifax Citadel Regimental Association as a teacher/administrator for their School of Piping and Drumming," Roderick explains. According to Bruce Gandy, "Roddie is very unselfish and gives a lot of his time to helping the junior programs here in Halifax, making the school go from strength to strength." Currently, the School runs two summer schools, three mini-competitions in the winter season, and has about 40-50 kids involved in its group lesson program for youth on Friday nights. "We also teach adults and kids privately during the week at the Citadel," adds Roderick. "The teaching program has been primarily responsible for our ability to form a second 78th Highlanders band which is now competing in grade four and we’re working on a third group who should debut in Grade Five in 2006." "The piping and drumming scene in the Maritimes is generally very positive. There’s great variety in the Games here – each has its distinctive personality – and the scene, while competitive, is very friendly and supportive overall. I think the professional piping contests in the region are going to be especially interesting over the next while as a group of younger players comes into the grade. We’ll now have perhaps ten or twelve professional players each contest as opposed to the four or five we had a few years ago. Its great for piping in Atlantic Canada I think.